Every time you look at Elite: Dangerous, it changes into something new and different, by which I mean they add some more spaceships to fly and solar systems to visit. Frontier’s successfully Kickstarted space simulator started out with just a single system to fly around, before expanding to “a few” and then finally to “fifty five”, leaving the end goal of 400 billion star systems feeling somewhat distant. But it’s getting there, and very quickly too. 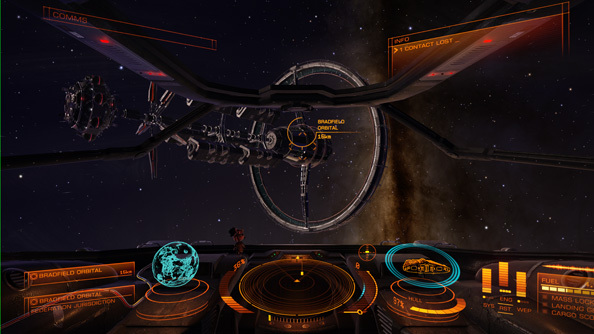 Elite: Dangerous has recently soared into its beta phase at a price point of £50, which is relatively affordable considering access to earlier versions costing upwards of four times that. Those versions, of course, were prototypes and rough drafts of what was eventually to come. And that early money was being pumped right into Elite: Dangerous’s embryonic heart, flushing it with the funds required to fuel its on-going development. The version available today is built on all of that nourishing fan trust and silly rich people money. But has the Elite: Dangerous become a more enticing prospect for players not quite mad enough to drop hundreds of pounds on a game about ferrying vegetables through hyperspace, is it time to consider buying into Braben’s space-dream? Yes! It’s time to consider that very thoroughly, and with some care considering the game’s rapidly evolving state. In fact, if you could mentally end each of the following paragraphs with “but it’s still in early development and absolutely everything I just described might have changed by the time you’ve read this” then this appraisal might be more easily swallowed. Here’s how Elite: Dangerous plays right now. There are fifty fivestar systems all sitting in a tiny, closed-off neighbourhood of the galaxy, most of which host a space station of some description. You can dock at these stations to take on missions from bulletin boards or to buy commodities, which you can then trade to other stations in different systems for profit. The bulletin board missions are typically bounties on NPC ships, requests for a particular commodity or long haul deliveries. Bounty hunting requires that you’ve outfitted your ship with an appropriate armory of big laser guns, fulfilling a demand for a commodity is a simple entry-level money spinner, while the long haul missions usually require a larger sized and more expensive cargo ship than new players can afford. Besides the bulletin board and commodities, you can earn cash by encountering unidentified signal sources in space, which often harbour discarded loot, dodgy black market dealers who’ll buy certain items you jettison or pirates with bounties on their heads. You can also, in theory, destroy other ships in anarchic systems to steal their cargo. Those ungoverned systems also host stations that will look the other way while you offload stolen or otherwise illegal goods, whereas lawful systems teem with police ships armed with cargo scanners. In practice the black markets in anarchic systems are best used to sell any cargo you found floating in space, which is considered by the police to be stolen. Chasing bounties often means exploring a system at random in an attempt to stumble upon a combat zone, where bad guys seem to prefer to assemble. Elite: Dangerous excels at space combat — it’s literally the core around which the game’s been built and expanded upon — very successfully employing a classic, joystick-based, roll-and-pitch dogfighting style. Your ship’s yaw controls are achingly slow, instead forcing you to twist and spin your ship through space, banking sharply in a bid to outmanoeuvre your opponent. Power can be diverted to weapons to slow their overheating, to your engines to improve your handling, or to your systems to increase the speed at which your shields recharge and your jump drive powers up (should you prefer to run away like a big space coward). There are a small handful of ways to reliably and safely amass a small fortune, which can be spent on buying new ships and making available even more avenues towards space-wealth. The trading system makes little sense however. The map of trade routes is a pretty but unorganised mess of colours denoting the directions in which certain kinds of commodities are being sold, but in practice you’ll find they often have no impact on the prices found in stations. Instead you’ll resort to mental notes of lucrative routes and stick to them to churn up enough capital to move on to trading more and more expensive commodities. Like everything else, it’s a work in progress. There’s hardly any variety in the bulletin board at this stage either, with the same few missions popping up repeatedly in every station. This can make the early routine of checking for simple delivery missions before stocking up on commodities a tedious affair. And ultimately, if you’re playing purely as a trader in this version of the beta, the thrill of jumping into a system, supercruising through empty space for two minutes, then circling around a station for a further two minutes before finally docking, very rapidly loses its charm. Dropping out of superluminal speed only to find your destination is a further 20km away is the game’s most disheartening sight, enough to have you mourning Elite 2’s time-acceleration system. Crossing large distances in Elite: Dangerous isn’t particularly interesting, with little else to do besides make minor course corrections while staring out of your windscreen at passing stars. There are those unidentified signals to investigate, but they’re speedbumps and rarely worth slowing down for. The way the engine works with the online servers too — by loading up an instance of space when you drop out of supercruise — isn’t seamless. Instead there can often be long, crude, ugly pauses as you shift from supercruise to regular engine speeds. Stopping to investigate an errant signal, one that might be a pirate ambush, just isn’t an appealing prospect. But critically, Frontier know all this. They’re working to make it better right now. There’s a clever man or woman somewhere this very second tapping a pen against their chin thinking really hard about how to make journeys through space more fun. Beside that person is another person doodling a redesigned trade route map, one that makes the tiniest bit of sense. Frontier have a loud community of beta players who shout about the things they don’t like and shout about the things that they do. They are not afraid to overhaul entire sections of their game to improve it. Supercruise is a great example of this, having been drastically renovated to make journeys shorter and less prone to overshooting their target destinations. 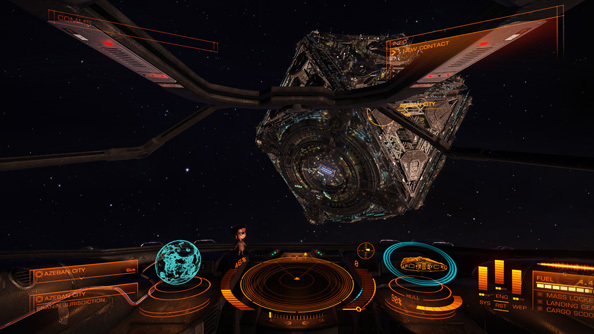 In half a dozen updates’ time Elite: Dangerous will be unrecognisable from its current state. And already the game is an immersive and atmospheric thing, with easily the best sound design of any game since Rogue Leader 2 on Gamecube. Every ship has its own peculiar array of engine sounds. The Sidewinder goes fwum-fwum-fwum when you engage its lateral controls. The Eagle accelerates like a sportscar, warbling like a mad exotic bird as it goes. Tearing through space at faster-than-light speeds is like rolling a boulder through a thunderstorm, and planets make an unscientificwhoosh sound as you whip past them at physics-breaking speeds. Elite: Dangerous is glorious simply to listen to, chucking out sci-fi’s tired standard ofpew-pewtropes for an original and remarkable style all its own. 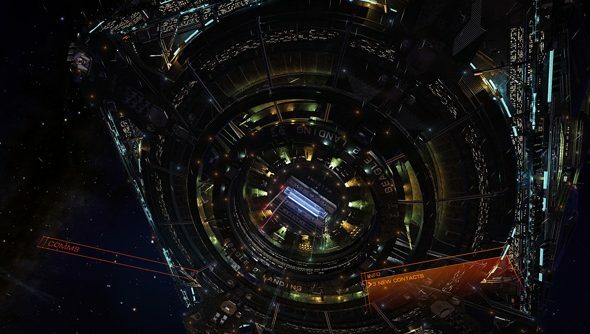 Whether or not you want to invest £50 in the Elite: Dangerous beta depends on whether you want to take an active interest in its development. If everybody at Frontier were to fall down a huge hole and development on Elite: Dangerous were to suddenly cease, this current version of the game would no longer be worth £50. Its fledgling systems go nowhere, its open world is cordoned off, its trade runs become exhausting, its online player interaction is limited and its universe feels static. 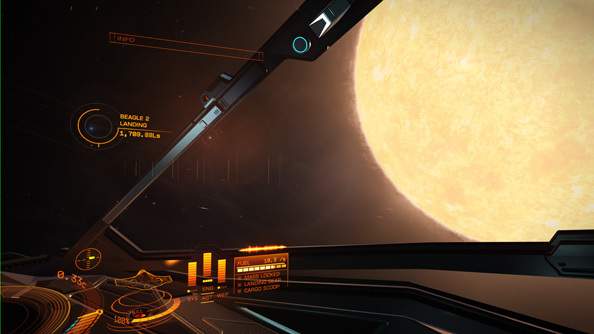 Elite: Dangerous is nowhere near finished, nor does it make any claim to be. No, what you’d be paying for now is a front row seat to the gentle unfolding of Elite: Dangerous’s design, warts and all. To me, and potentially to you, that’s a tremendously exciting opportunity well worth the asking price. But to almost everybody else, to those wanting to put their money down and receive a game in return, I’d have to recommend waiting. I would very begrudingly recommend waiting, and then I’d relent slightly by saying, “but look, if you reckon you’re the least bit interested in how this game is panning out, you should probably just go for it really”. None of that will fit in the verdict box however.